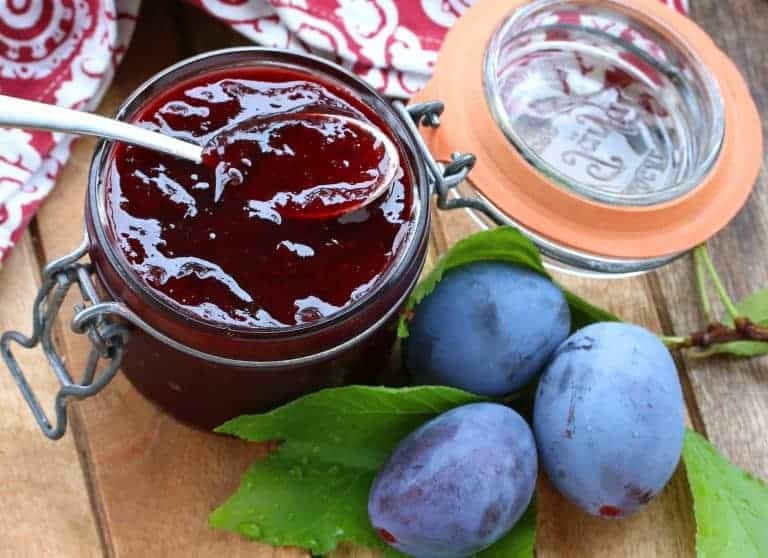 This plum jam is delicious added to cakes, in muffins, on pancakes, ice cream and any other way your heart desires! You can make it either with or without pectin. With four Italian plum trees in our yard I get busy the end of every Summer processing hundreds of pounds every which way possible: Dried, canned, frozen, dehydrated, turned into Fruit Leather, cakes (including this German Plum Cake), cobblers, Plum Butter, Asian Plum Sauce (Duck Sauce) and anything else I’m able to think of. 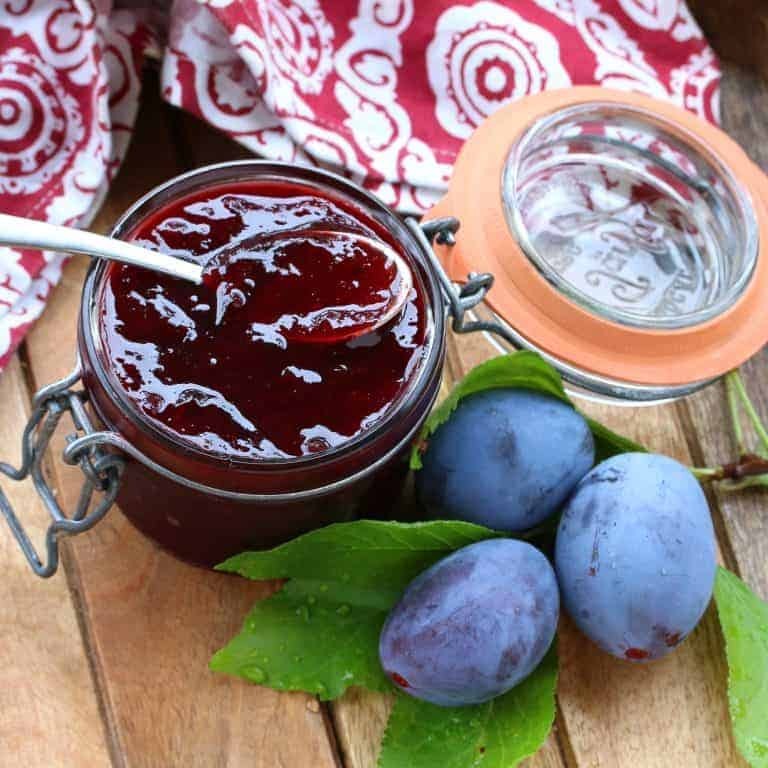 Plum jam is another great way to turn those wonderfully plump, flavorful and juicy plums into something delicious that you can enjoy all year long. It’s delicious added to cakes, in muffins, on pancakes, ice cream and any other way your heart desires! 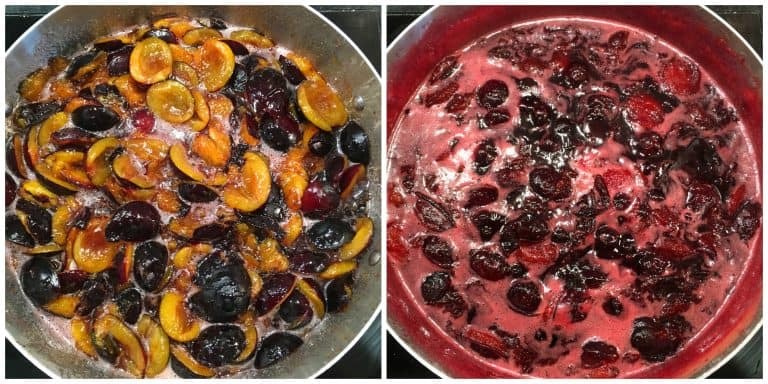 Wash the plums, cut them in half, discard the pits and place the plums in a large pot. If you’re NOT using pectin and are letting the jam simmer for a long time, there’s no need to chop them because they’ll break down by themselves and you can always give the jam a mash or use a hand blender to puree part of it later on if you don’t want as many chunks. 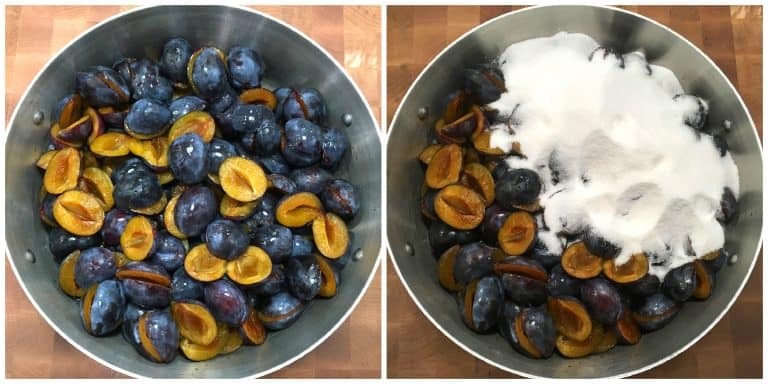 If you ARE using pectin that means the jam will only boil for a few minutes and the plums will not break down, so go ahead and chop the plums up. Add the sugar and lemon juice heat the pot, initially over medium heat so the plums or sugar don’t scorch. Once the plums juices start to run you can increase the heat. 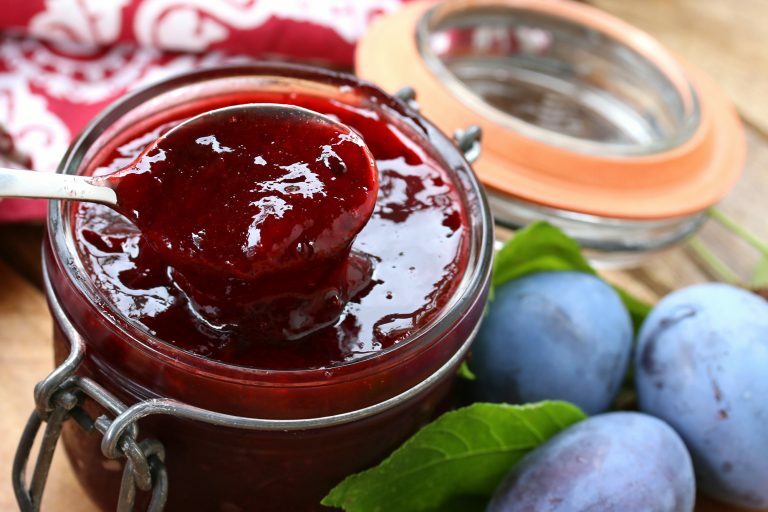 If you’re NOT using pectin: Simmer the plum uncovered until an instant read thermometer reads 220 degrees F. That’s important in order for the jam to set and not be too runny. Alternatively, freeze a couple of spoons and drop some jam onto them: If the jam sets and is spreadable, but not runny, it is done. Don’t bother skimming off the foam because that will all dissolve by itself towards the end. If you ARE using pectin: Follow the package instructions of whatever pectin you are using. Skim off the foam. If you like you can use a potato masher or a hand-held immersion blender to mash/blend part of the jam until the desired amount of chunkiness is reached. 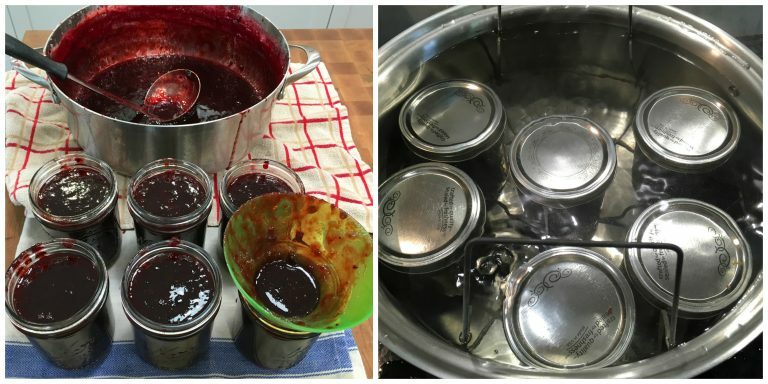 Using sterilized jars, ladle the hot jam into the jars and wipe off the rims with a moist towel to make sure no jam is on the rims. Fill each jar to no less than 1/4 inch from the top. Wash the lids with soapy water and, place them on the jars and screw on the sterilized rings. Boil them in a water bath canner for 10 minutes. Carefully remove the jars and let them sit undisturbed for 24 hours before removing the rings (optional) and storing them in a cool place. They will keep for up to a year. Once opened, store in the fridge, will keep for at least a month. If you're NOT using pectin and are letting the jam simmer for a long time, there's no need to chop them because they'll break down by themselves and you can always give the jam a mash or use a hand blender to puree part of it later on if you don't want as many chunks. Add the sugar and lemon juice and heat the pot, initially over medium heat so the plums or sugar don't scorch. Once the plums juices start to run you can increase the heat. 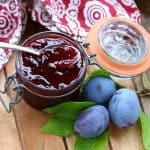 If you're NOT using pectin: Simmer the plum uncovered until an instant read thermometer reads 220 degrees F. That's important in order for the jam to set and not be too runny. (Alternatively, freeze a couple of spoons and drop some jam onto them: If the jam sets and is spreadable, but not runny, it is done.) Don't bother skimming off the foam because that will all dissolve by itself towards the end. Makes about 7 half pints. Your jam looks lovely and lucky you to have so many nice plum trees. Right now I can get Italian plums at a great price so I think it is time to make plum jam. Hey Kimberly…! Awesome, this is one of my favorite fruit and i will make a cake for my kid with your plum jam, Thanks for sharing ….keep sharing your new amazing recipes…..! I made this jam. It set perfectly and is yum. Never before have I had success with jam, until now. Thank you for the recipe. That’s fantastic, Sarah, congratulations and thank you! Thank you Kimberly for what looks to be a great recipe for plum jam. At what stage is the lemon juice added please? Hi Erin, thanks for catching that oversight. Add it in the very beginning along with the sugar. Happy cooking! 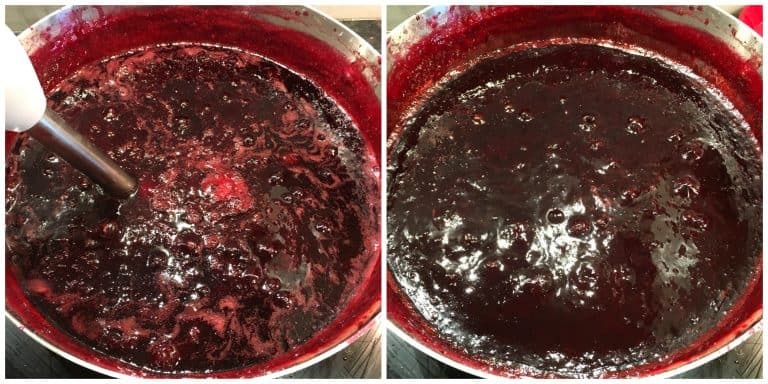 Hi Kimberly I made your Jam recipe and it turned out brilliant. Very, very tasty and definitely a keeper. Thank you so much! I’m so happy to hear that, Erin, thank you! Have not tried the recipe yet, but it seems pretty good. I am making jam today, so we’ll see.